Psychiatrist and mindfulness expert Holly Rogers explains why you should not even try to stop your thoughts. Plus, a guided practice on noticing your inner chatter with curiosity rather than judgment. Today we are going to practice noticing and working with our busy minds. As we begin this meditation I’m going to share with you the single most important bit of information that I believe will help you as you develop and deepen your meditation practice. When you settle into your meditation practice, bringing your awareness to the sensations of your breath, don’t expect to and don’t even try to stop your thoughts. Trying to stop your thoughts is not really possible and it often leads to a great deal of frustration. 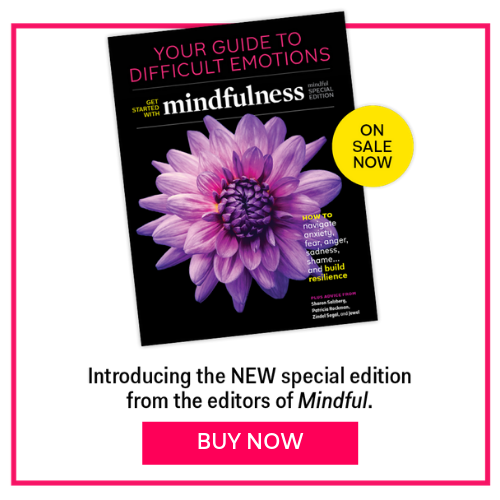 Frustration that might make you doubt your ability to develop a mindfulness meditation practice. Rather than trying to stop your thoughts, work on changing your relationship to your thoughts.